They say that something worth having is worth waiting for and in the case of this waterfront home on Sovereign Island it proved to be true. The owners Franci and Angelo turned their dream into a stunning reality after falling in love with the block of land because of its position. As Angelo explains “It was north facing with uninterrupted views of the Broadwater and a small island with a white beach across the water within rowing distance – if you had the urge! 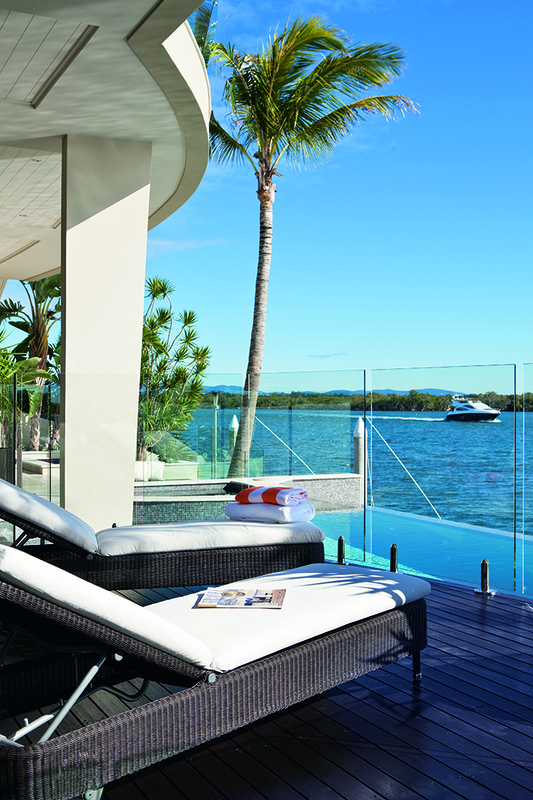 The waterway in front of the house connects the Coomera River with the seaway and always provides an interesting changing landscape of million dollar cruisers, yachts, fishing boats and seafarers of all kinds. 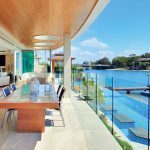 At other times it’s so quiet that you may think you’re at a secluded resort or holidaying on a large cruise liner, just leaving port.” Finding a house to do justice to the block was an easy decision once they saw the work of building designer Paul Clout. “We loved the resort feel and the uniqueness of his properties. 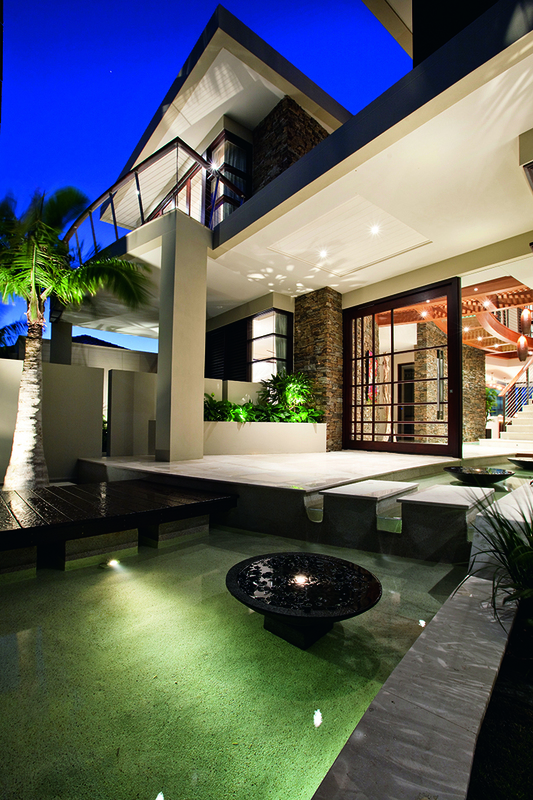 We especially liked his use of water features and the nautical touches in his designs,” says Angelo. As you enter the home you are surrounded by glass, timber, stone and water – it’s a sensory experience much more than the sum of its parts. No matter where you look there is something in the detail that delights the eye. Stacked stone walls made of New Zealand South Island schist flank the entry and were pieced together by hand like a giant jigsaw puzzle. 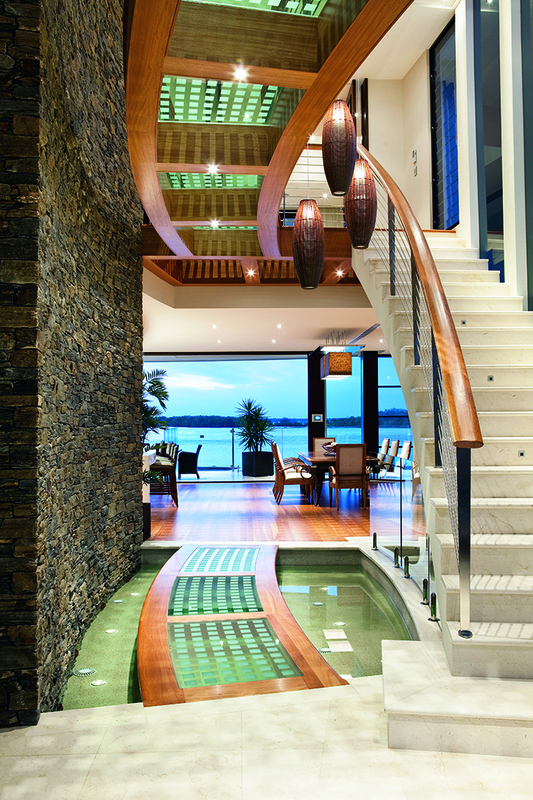 The walls continue inside the foyer curving slightly as if guiding you inside as does the gang plank over the water-filled walkway. Internal water features like these are a signature trademark of Paul Clout’s work and encourage a tranquil ambience. 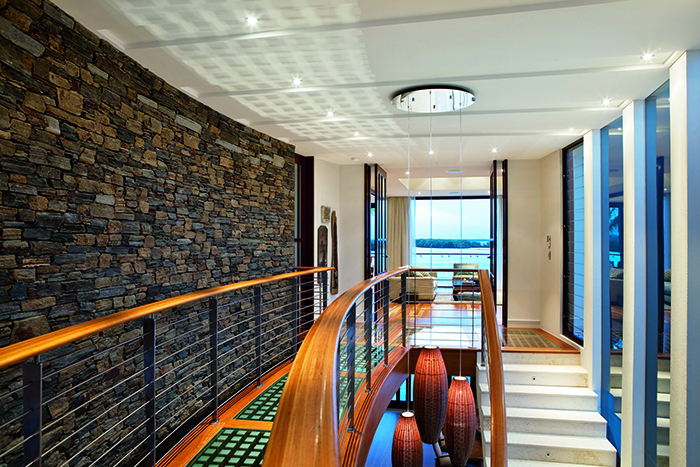 The water theme continues the nautical influence in the timber-encased steel bridges with glass panels that connect the upstairs bedrooms (taking 2000 hours to construct) and the timber lattice on the walkway which is echoed in pattern on the etched glass tiles. The study sits beside the front door and elevates the meaning of ‘home office’ to a new level. It was paramount that there were water views from the room as Franci and Angelo spend a lot of time here. Paul Clout’s design cleverly allows for water glimpses through the courtyard beside the office linking the lounge and the study. This configuration also provides water views from the upstairs spare bedroom where any guest would be happy to find themselves. All outside areas come alive at night with extensive LED lighting used in the gardens, ponds and joinery. 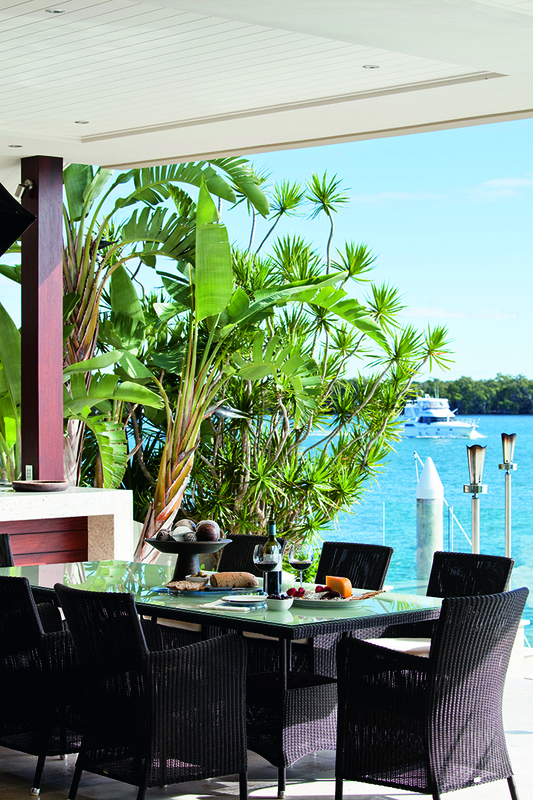 Gas flares on the waterfront entertaining deck were sourced from Hawaii and add a tropical touch. 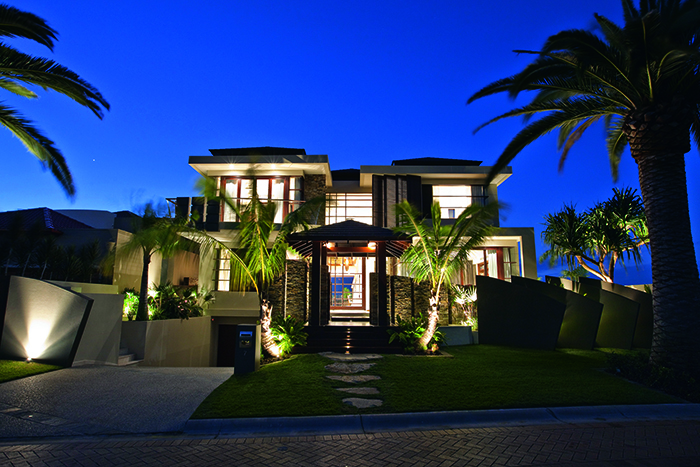 Originally from South Africa the owners have been inspired by their travels. 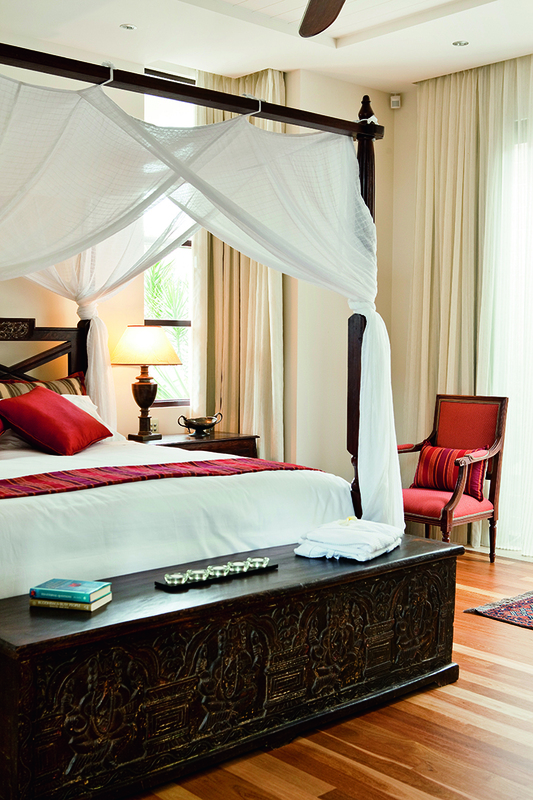 Touches of Fiji, Hawaii, Bali and Africa lend a resort-like feel to the home. The open plan design of the home and the large opening doors and louvres ensure plenty of airflow, and air conditioning is seldom used. 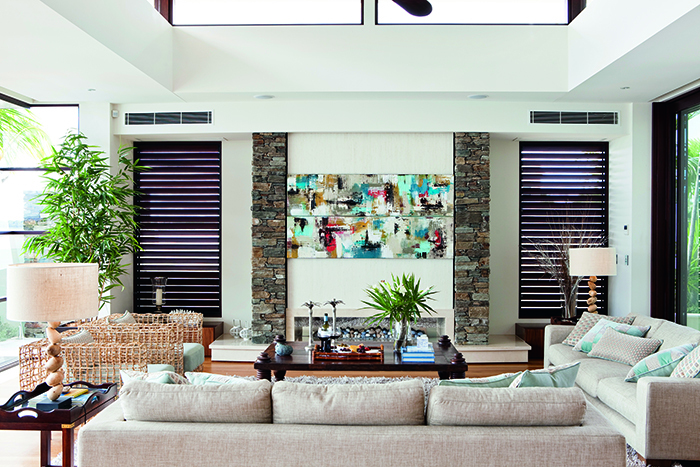 The living area is decorated in soothing neutral tones. 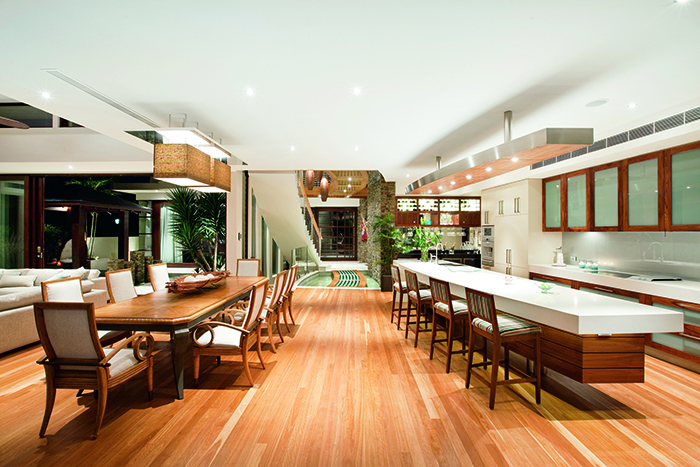 Stunning blackbutt flooring looks sensational and works as a great backdrop to the room. Jardan sofas in oatmeal are given a subtle shot of colour with cushions in an Asian style fabric by Romo and a shaggy rug and woven cane occasional chairs by Kenneth Cobonpue give a healthy dose of texture. Unusual lamps from Casa Guardi are eye catching but the show stopper in the room is the Paul Colby artwork that splits in two to reveal the flat screen television with the touch of a button. 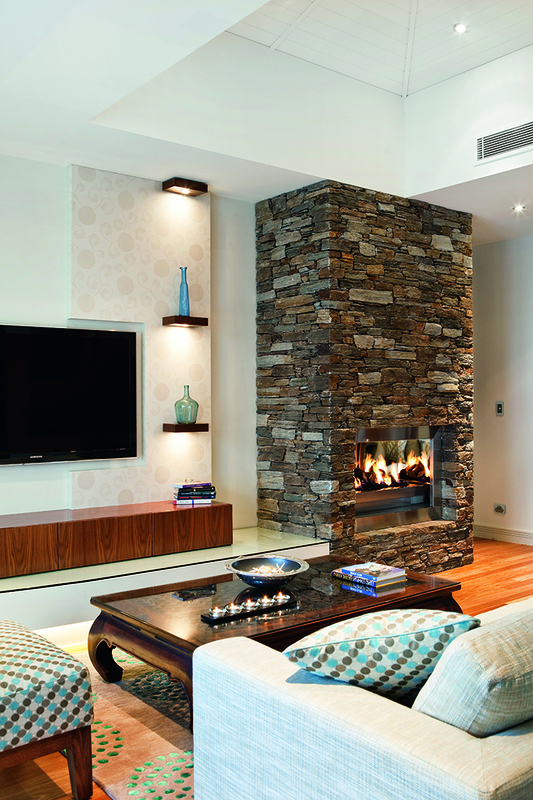 A pebble-strewn Real Flame fireplace surrounded by stacked stone comes alight at the flick of a switch too. The main bedroom has its own retreat complete with fireplace. Not only does the fire cast a warming glow, the lighting in the room has been carefully planned. Lights hidden under shelving highlight special pieces on the shelves as well as emitting a soft glow at night. 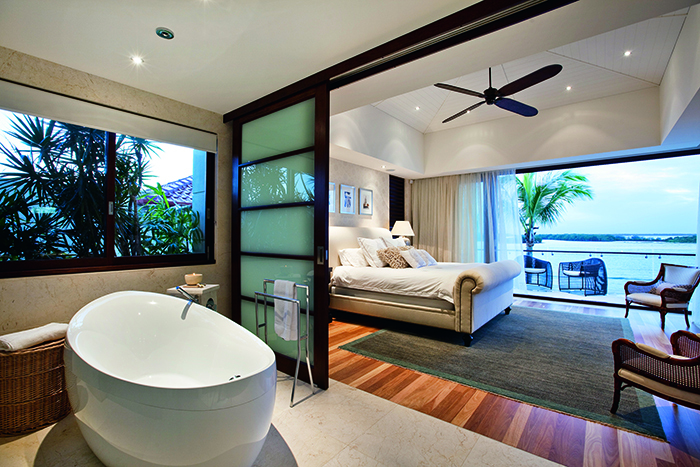 The large master bathroom finished in marble and American walnut has a gorgeous freestanding Villeroy & Boch bath that is filled via a waterspout in the ceiling, adding to the resort feel. The home has three outdoor entertaining decks all facing north; a sundeck overlooking the pool, a deck with built-in seating and one with a wet bar and piped gas barbeque. Next to the pool there is a heated spa and an outdoor hot/cold shower. And with a twelve-metre reinforced pontoon complete with jet ski lift, water and electricity there really is no need to ever leave home! 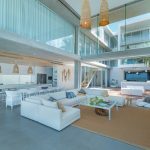 The result is a wonderful contemporary family home that melds together the owners’ style and the best of resort-style design. While the home is impressive it is by no means impersonal, and personifies Queensland living; easy, relaxed and comfortable.